There is something uniquely terrifying about not being able to get your breath. Like us, our pets can suffer from conditions that hinder breathing. Talk to your veterinarian about Terbutalin (Generic of Brethine & Bricanyl). It's a generic for Brethine which is prescribed for asthma, collapsing trachea, chronic allegric bronchitis, and chronic obstructive pulmonary disease. Terbutalin works by relaxing the airways which makes breathing easier. Terbutaline is the Generic Alternative to Brethine and Bricanyl. Terbutaline should not be used in animals with known hypersensitivity or allergy to the drug. 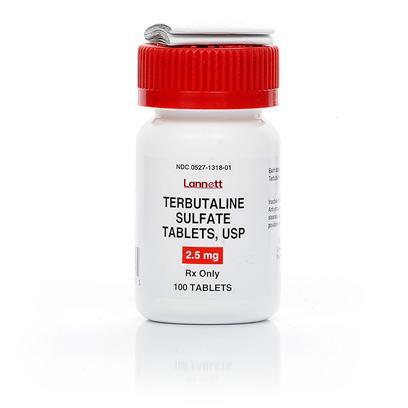 Terbutaline should be used cautiously in animals with diabetes, high blood pressure, overactive thyroid gland (hyperthyroidism), animals taking thyroid supplement (L-thyroxine) or those with a seizure disorder or epilepsy. Terbutaline should be avoided if any heart rhythm abnormalities are present. Terbuatine may interact with other medications. Consult with your veterinarian to determine if other drugs your pet is receiving could interact with terbutaline. Such drugs include certain antidepressants and anesthetics.